A large number of local and global players are competing with one another in the global energy storage systems market. This makes the landscape fragmented in nature. The market is also witnessing the foray of new players wanting to cash in on the unmet demands of consumers. To make headway in the market, players are focusing on product development and strategic mergers and acquisitions. They are also enhancing their distribution networks to steal a march over their competitors. 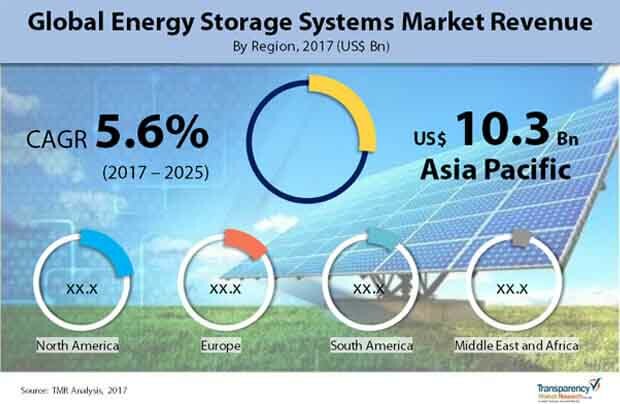 The global energy storage systems market is being primarily driven by the soaring uptake of electric vehicles which are much less polluting than fuel-powered ones. Apart from the automotive segment, the commercial and industrial establishments too are resulting in sales as their need to store energy is high. The residential sector is another crucial contributor to sales because of the uptake of solar panels to reduce dependency on grid electricity. A report by Transparency Market Research predicts the global energy storage systems market to become worth US$52.59 bn by 2025 from US$32.60 bn in 2016 by expanding at a steady CAGR of 5.6% from 2017 to 2025. Depending upon the type of technology, the global energy storage systems market can be divided into electro chemical, thermal storage, mechanical energy storage, and others. Electrochemical storage can be again divided into lithium-ion battery, lead acid battery, sodium sulfur (NaS) battery, flow battery, and others such as nickel metal hydride (NIMH), nickel cadmium battery (NICD), and nickel iron battery. Currently, the electrochemical storage technologies are seeing maximum uptake and in the years ahead is predicted to expand at a healthy clip. The mechanical storage technologies, again, can be divided into pumped hydro energy storage, flywheel energy storage and compressed air, and liquid air energy storage. It accounts for the leading share in the market at present owing to the soaring use of pumped hydro. While thermal storage are expected to grow at a CAGR of 5.6% between 2017 and 2025. From a geographical standpoint, Asia Pacific leads both in terms of market share and growth pace. By registering a CAGR of 6.0% from 2017 to 2025, the energy storage systems market in the region is projected to attain a value of 16.5 bn by 2025. The market in the region is being driven mainly by the rising sales of electric vehicles and China is at the forefront of it. This is because strict policies pertaining to pollution that has encouraged take-up of electric vehicles in the region. Besides, China is also an international nerve center of battery manufacturing. Many other highly populated and polluted nations, namely India are following suit and this is expected to stoke impressive growth in the market in the years ahead too. North America trails Asia Pacific in terms of market share. The market in the region is mostly driven by the U.S. and Canada. Growing thrust on electricity cost reduction and need for energy efficient devices are expected to result in higher demand for energy storage systems within the residential and automotive end-use segments. The TMR report forecasts the market to rise at a steady CAGR of 5.6% in the forecast period to become worth US$14.6 bn by 2025. Some of the key companies in the global energy storage systems market are ABB Ltd., BYD Company Limited, EOS Energy Storage, Evapco, Inc., Maxwell Technologies, Inc., General Electric Company, Hitachi, Ltd., LG Chem, Ltd., NEC Corporation, Panasonic Corporation, Schneider Electric SE, Siemens AG, and Tesla. The energy storage systems market report provides analysis for the period 2015–2025, wherein the period from 2017 to 2025 is the forecast period and 2016 is the base year. The report covers all the major trends and technologies playing a key role in energy storage systems market growth over the forecast period. It also highlights the drivers, restraints, and opportunities expected to influence market’s growth during the said period. The study provides a holistic perspective on the energy storage systems market’s growth throughout the above mentioned forecast period in terms of revenue and volume (in US$ Bn), across different geographies, including Asia Pacific, South America, North America, Europe, and Middle East & Africa (MEA).